1) How do I share Animations and Drawings to the camera roll? Video (H264) The resolution options are: 480 x 360, 640 x 480 or 1024 x 768. Once you save the video to your camera roll, it can then be uploaded and shared to email, message or any social media. Data (DoInk) Data can be shared to your DoInk shared folder to be used in the DoInk Green Screen App (purchased separately) or saved to iPad files. 2) Is the Animation and Drawing App Available for iPhones? No, the Animation and Drawing App is only available for iPads. 3) Can I change the FPS (Frames Per Second)? No, at present the Animation and Drawing App only creates videos in 30 FPS. 4) Can I Use Photos in Drawing Mode or Composition Mode? You can import photos or videos from your camera roll into the drawing canvas to trace over and rotoscope (like this example) when you are in drawing mode, but your photos will not be saved to the final project. To put images and photos into your final project, you will need to be in Composition Mode. This tutorial is a good example of how to use an image from your camera roll in your project. 5) How do I Import my Animations into the Green Screen by DoInk App? 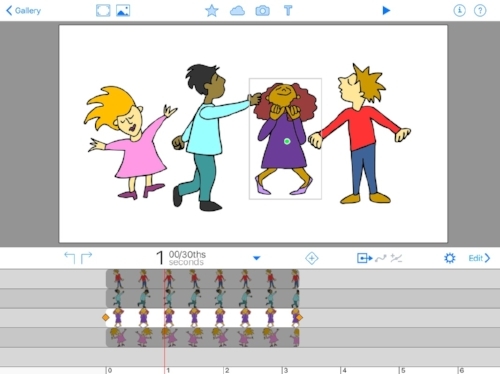 We have a good tutorial on How to share files from the Animation and Drawing App to the Green Screen App. 6) Why Can't I Get Access to the Props Library? 1) Look in your iPad settings under the Animation and Drawing App to see if the 'Hide the Prop Library' option is checked or unchecked. 2) Take the iPad off the School/Building wifi and use another wifi. Do you see the props? If so, your School/Building firewall may be blocking them. Contact support@doink.com for more information. 7) How do I delete a Project? Go to the 'Gallery' view in the App, tap the icon of a box with an arrow pointing up. Three boxes will appear on the right. Tap 'delete'. A message will pop up that says 'Delete the selected project?' You will have an option to Cancel or Delete. Tap the 'Delete' icon.